The paperback and ebook together. Hold the print version in your hands and make notes in the margin, and get an electronic version so you can start reading right away, with all updates included. Or read the ebook yourself, and get the paperback as a gift for someone else! The Value of Simple: A Practical Guide to Taking the Complexity Out of Investing is a plain-language guide to investing for Canadians. 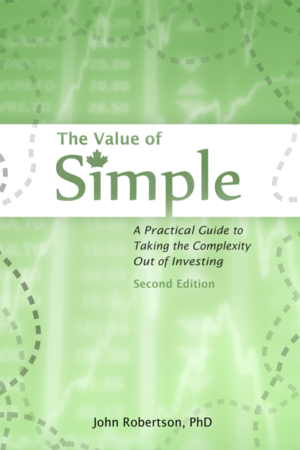 Putting your money to work can look suspiciously like math at times, but this book lays out a simple approach that anyone can follow. With a focus on developing good processes to minimize the room for human error and step-by-step instructions, the book will walk you through the elements of managing your finances for the long term: how to devise a savings plan, stick to it through automation, determine an appropriate asset allocation, track your investments, and deal with the inevitable issue of taxation. It provides tools and templates, along with default suggestions and rules-of-thumb to help prevent analysis paralysis and get you started as soon as possible. Canada has the highest investment fees in the world, on top of a unique and confusing tax system that features four-letter words like RRSP and TFSA. Fortunately there are low-cost index funds that make it easy and rewarding for you to become a do-it-yourself “couch potato” investor. There are already many texts that explain why index funds are a smart strategy; this book will focus instead on how you can use those conclusions to actually implement an investing plan for your life. Control what can be controlled; minimize fees and effort. Investing doesn’t have to be complex to be successful. This bundle will include the paperback (sent by Canada Post — expect approx. 7 days for free delivery) and an electronic version so you can start reading right away. Or read the ebook yourself, and get the paperback as a gift for someone else! The download will consist of a zip file (compressed archive) that contains three files: an ePub for Kobo and Sony readers, AZW3 for Kindle, and PDF for tablets and computers.